Brea Reese Giveaway! Win an assortment of alchohol ink! Congratulations to Kim Thompson – this week’s lucky winner. Yahooo! It is Wednesday! Every single Wednesday we team up with the BEST manufacturers in the industry to give one lucky winner a fabulous prize package. This week is no exception. Check out this CRAZY AWESOME prize package from the wonderful people over at Brea Reese. WOWZERS! One lucky winner is going to LOVE this collection. Why not you? 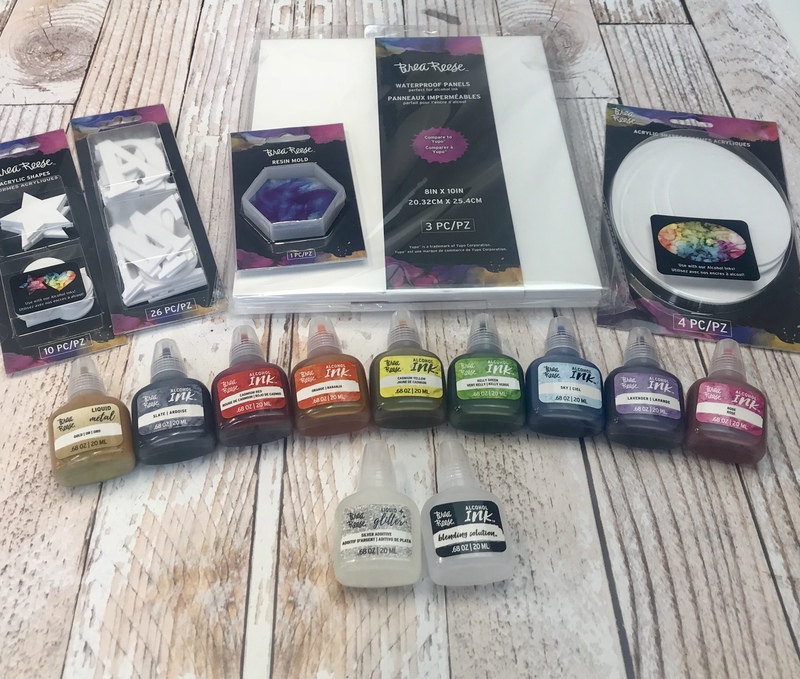 This awesome prize package includes an assortment of alcohol inks, blending inks, silver additive, resin mold, acrylic shapes and waterproof panels perfect for playing with alcohol inks! This prize will be an absolute BLAST to play with! 1. Visit Brea Reese on facebook – CLICK HERE – Say hello from Creative Scrapbooker Magazine! You have until March 29th at midnight to enter! It would be interesting to play it this. Hi, thanks for the chance to win such a great prize! It looks amazing. Have a great day & thanks for the quality magazine! I love reading it. Thank you Creative Scrapbooker Magazine for a chance to win! J’adore! Bien contente de connaître une nouvelle compagnie. Des couleurs ravidsantes qui enrichirons mes créations. Bravo! What a super prize, today it’s my birthday and I love to win this! Thank you Creative Scrapbooker Magazine and Brea Reese for this stunning prize. Happy birthday to you, hope you have a fantastic day! It is really nice of you to give this away. I am most interested in the resin? I dabble in all crafts and could use it. I’m dreaming of winning !!!! This is an amazing prize. I would love to try those products. Thanks for the chance. What an amazing prize pack. I’ve only recently started playing with alcohol inks. I have a few of the Ranger pearls and some of the regular inks. I have seen people play with the Brea Reese ones and have been dying to try them. I haven’t used Resin yet as I find it a little intimidating but I recently bought some IOD molds and want to give it a try. Thank you for offering such a wonderful prize! I love to mess around with alcohol inks. Wonderful prize package. Wowzers is right! What an incredible prize package! How do you gals do it? Thank you for this incredible opportunity! Have an awesome day! What a lovely prize! For one more time you amaze me! Thank you so much for always having something for us! I can imagine the hours I can spend creating one of a kind images with this fantastic Brea Reese collection. Playing with the amazing techniques along with ideas from Brea Reese and Creative Scrapbooker are endless. Thank you for this great giveaway to get our creative juices flowing. Another great prize pack. Thanks for the chance to win. Another great prize pack. You guys rock. How fun. I have been wanting to play with some alcohol inks. Love the colour choices of these alcohol inks. Happy Hump Day CSM! Great prize!! Thanks for chance to win Wednesday’s! Wow what a wonderful prize. Would love to win. This would be a great assortment to play and explore with. OMG!!! This is a super awesome prize package. Brea Reese and Creative Scrapbooker Mag, you are amazing. I would love to be able to try these! Thank you for the chance to win them! Thank you for another fabulous giveaway! Wow a wonderful Wednesday!!! I would love it to be me winning this prize package. Have always wanted to try alcohol inks and so many other goodies and so this would be just perfect to help me get my hands dirty! Thank you Creative Scrapbooker for the opportunity at this prize package!!! Wow! So many fun things to play with! What a great prize! I need Brea Reese in my life!! These inks are amazing. I would love to win this giveaway. Thank you!! Would love to try this product out. Another wonderful prize! Thanks CS and Brea Reese for this opportunity to win! I would LOVE to experiment with these products!!! Wow – another great Wednesday prize. Always have wanted to try cresting with these. Would love a chance to. I have been following Brea on FB for awhile and I have been dying to try her alcohol inks! The colors look so vibrant. Financial situation has put a halt on it but would so love to win them!!! So fun! I haven’t tried alcohol inks! Would be awesome to win this! Thanks for opportunity. Love to win the Brea Reese ink package. I havent yet entered the world of alcohol inks, but would love to try! Thanks for the chance to win! Alcohol inks are my newest obsession! Wowza! What an awesome giveaway….one lucky winner is going to have a blast!! I would love this prize. THANK YOU for the chance. I don’t have any alcohol inks, if you can believe it! I would love to embellish with this cool product. it looks great! Such unique and creative products. I would love to try these. They would spark my creativity. Thank you for the chance. I left them some love,! Wowie! Thanks for the giveaway! It looks so fun! Thank you for the chance to win. I wrote a hello 👋 to Bree this morning from csm 😉! Thank you for chance to win. Beautiful prize pkg. Would love to play with these colors!! Another fun prize this week! I haven’t had a chance to play around with alcohol inks but have been wanting to try it. This prize would be perfect to do so. This is a fabulous prize that will bring tons of joy to the fortunate recipient. Thanks to the sponsors. A new alcohol ink brand! Yippee! Looks like hours of creative possibilities in this fabulous give away package! This is one awesome prize pack. Those at Brea Reese are very generous. Whomever wins will have a blast with this. Sure would be nice if it were me. Wow! Going over to visit them now. Thanks for a chance at another great prize from an amazing sponsor!! Great prize! Thanks for another great give away! What a fabulous prize would love to win this one thank you for the chance! Looks like this would be fun to play with! Thanks for the chance to win! What a great birthday present it would be to win this. OMG!!!!!!! The best prize EVER. So want to try her products. Thanx CSM! Good morning CSM! What a fabulous prize! Love this medium! Would so love this in my craft space to create! Great prize. Thanks for the opportunity to stir up some creative juices. What a great prize package! I’d love to win this! Yay for brea! I would love to learn and play with her goodies!!! Thankyou CS!!! Yes please I want to play with these inks! What a great prize!! Would love to play with these products. Done!!! This is an amazing prize!!! Awesome prize. Have not tried these yet, but they look like they would be fun and the colors are gorgeous. Thanks for the chance to win. Just checked out those awesome inks at Brea Reese . Would just make my day , week , and month if I happened to win them. Thanks for the chance. Amazing giveaway…love to play with those inks! What a great creative prize to win . These weekly giveaways are always to awesome….pick me, pick me!! Would love to win this and try out alcohol inks! My 15 yr ild is obsessed with alcohol inks….we could do so much with this prize. Love these inks. Would love to win these products! This would be a great package to win! Wow, what a superb prize!, Thanks for the chance. Wowza, you’re not kidding! What a fabulous prize someone is going to be so happy to win. Thanks for the opportunity. I see new inks to try. Fantastic gift package. This is an amazing prize – fingers crossed! It would be nice to try these new products. They look like fun. Cheers! I love playing with alcohol inks! Would love to with this, thank you for the opportunity! These look fantastic popped over and said hello and watched a few videos very kewl !!! FUN PRODUCTS! WOULD LOVE TO TRY THEM! What an amazing assortment! I’m so inspired! This looks so cool and interesting! I would love the chance to win this and try everything out. Thanks for the chance to win! What a wonderful gift this is. I would LOVE to win this as I am just starting to get into alcohol inks. Thanks for the chance. What an opportunity, thanks for the chance to win! This would be a great Present. I would love to try these!Thank you for the chance! Love playing with alcohol inks, would love to try out this brand! I haven’t played around much with products like these but her facebook page had some beautiful projects. I would love to win these to expand my creativity. Beautiful prize package! I would absolutely love to win these beauties. Love hearing about new products/creators, I have never heard about before! Those would be beautiful colours to play with! Would love to win this prize….just learning inking techniques. Always love to try and share new products. Thanks Creative ScrapbookervMagazine and Brea Reese for the opportunity to win this great package. Awesome products! I have some of their glitter inks and I just love them! That looks like an amazing prize package. These look really cool. Would love to try them out. What a great prize. Thanks for the chance. Would love to win this fabulous prize! These inks look awesome! Awesome Wednesday prize this week! So cool! Would love to work with these! Oh wow Brea Reese, what an amazing prize package! What an exciting time!! Thank you for this opportunity to win!! Whoever wins will be blessed!! Have a great day!! Amazing prize! Just beginning to work with alcohol inks, this would be so much fun! What an amazing prize package. Thank you for the opportunity to win! What a great package of fun! Thanks for the opportunity. Amazing giveaways. Love the colors! OMG I would absolutely LOVE to win 😍😍😍 thank you so much for the chance 🥰 my fingers AND toes are crossed! I have not done a lot of work with inks but would like to try them out along with all the other goodies. Thanks for the giveaway. Would love to win this package….it would be a blast to play with it! Oh WOW!! This is an amazing Prize Package – who wouldn’t want to play with all of these products!! Thank you for the opportunity and Happy Birthday!! What a great prize. This would be fun to experiment with. Thanks Brea Reese and CSM. Lovely prize…thanks for the chance to win! This would be so fun to play around with. Liked and said hello. I would love to win and try this! Cool! Thanks for the chance to win! These would be so much fun to play with! Thanks for the chance to win! This looks like a wonderful prize! Thanks for the chance to win! Happy Wednesday – I ❤️ playing with new products! Happy Wednesday! I ❤️ playing with new products!! Looks like fun stuff to play with! Oooh… I’ve never worked with alcohol-based inks. Wow, again such a wonderful giveaway. Thank you! Oh my oh my! Ehat a fabulous FANTASTIC giveway! So very exciting! Thanks so much for the generosity and opportunity. Love the chance to win such a fabulous giveaway. This would be so much fun to play with. Hi 👋 would love 💕 to win! It will improve my pages! Such a great prize to win, Thank you for the opportunity!! Love alcohol inks. The more the better. Thanks! This looks like a great prize!! Thank you for the chance to win. It’s an awesome package. Love to play with inks!! Sent message to Brea Reese. Would be super excited to win this. I have been wanting to try this for a LONG TIME!!! These would be fun to try to use. New to me! Thanks for the chance! I move everything About this giveaway! Thanks for the chance to win! Thank you Creative Scrapbooker Magazine! It would be great to win such a great prize. What a terrific prize package. So much creativity I would love to play with. So much fun in to be had in this prize package! It’s spring! Thanks for a chance! Great contest! Would love to try these! Wonderful colors…..and oh what fun to create with this set!!!! Wow! What a nice prize. I love alcohol inks and haven’t worked with these. Such a wonderful prize! What a great prize. I would love to try out these products. Hi. I am from Innisfail, Alberta, Canada. I love the prizes you have can out them to good use. Thank you for the opportunity to enter this contest. Have a good day. Thanks for a chance to win! I stopped by the booth at Creativation and played with the inks. Super fun and easy! What a lovely prize packet to win to achieve different colour techniques to my cards. I’m so glad there is still a scrap booking magazine around! Thank you for all that you do! I have seen these dyes and have been dyeing to try them! Thanks for the opportunity to enter for this drawing. What a nice prize. I love all the creative items that are posted on Facebook using these supplies. I would love to win so I can give some of the techniques a try. Wow what an amazing giveaway!!!! I’m dying to try these inks! Thanks for the opportunity to win & for the video tutorial! Gorgeous prize pack!!! Thanks for the chance to win! Great products from Brea Reese. Wow !! What a win! I hope I’m the lucky one! Thanks for the opportunity ! Thank you for the chance to win. Love her colors of alcohol inks. What an incredible prize! I would be busy for quite a long time, playing and experimenting. Thank you so much for the chance to win! Exciting colour range. I love alcohol inks ! Beautiful prize!!! Thanks for this chance!!! I use Tim Holtz inks exclusively and would love to try Brea Reese for my classes! Yes please i would love to win such a great prize. Thank you for a chance of winning. Oh wow, awesome prize package, off to check out on FB! Thanks for sharing! Something run to create with…sign me up!! The demo on Facebook by Brea Reese inks is awesome! someone is going to win a fab set of products!